July 2016 | IT Support | Los Angeles, CA | Orange County | WAMS, Inc.
Cybercrime has been a rising trend in the past 10+ years, and it only seems to be getting worse as the criminals continually become smarter and more organized. The scariest aspect of cybercrime is that it has truly evolved into a bona fide industry. From malware-as-a-service to security breaches and inside jobs, it continues to grow and flourish. In 2015, cybercrime on average cost US companies $15.42 million in damages per company attack alone. You more than likely have heard about some attacks in the past few years on large companies such as Target in 2014 or most recently, Ashley Madison in 2015, and you may be thinking that a firm of your size would be of no interest to cybercriminals. You would be wrong to think so, and a deeper look into your internal environment as well as the external environment of cybercrime will provide you not only a better general understanding but also the tools that you need in order to protect yourself. With a country as technologically advanced and focused on protection and security as the US is, it may have come as a surprise that we are so heavily targeted. The US however, has become such a target due to not only how relatively cheap it is to infect in respect to other countries, but also the size of the return that these criminals see on these highly inexpensive attacks. It costs less to infect in the US than any other country or region. On average it costs Cybercriminals about $0.07 per infection in the US; it costs twice as much to infect in Asia and Australia, $0.14 per infection, and $0.11 in Europe. While the average cybercrime costs companies $15.42 million in the US, they cost Japan $6.81 million and the UK $6.32 million; a significant correlation when the cost is taken into consideration. US entities affected by large scale data breaches in the past 10 years include Adobe, eBay, the US Military, Target, and Ashley Madison. The bottom line is that cybercriminals spend less to make more in the US, and it’s not helpful that we have seen decreased media coverage of high-profile breaches. The media does not take these breaches as seriously as they should, which has caused many top executives to retain the belief that their organization will not be targeted. It is important to understand that these companies have teams committed to their IT security and yet cybercriminals were still strong and strategic enough to get into their systems. If these criminals were able to victimize these large countries, then your firm is more than likely a piece of cake for them to infect. You are never 100% guaranteed safety from attacks; there is always a chance that you will fall victim to cybercrime but you can lessen your chances with awareness and implementation of online security policies in your firm. Cybercriminals are highly effective due to the way they have adapted to the digital environment. They no longer work individually on small scale projects; they have learned to work together and help one another, thus becoming stronger. Their incredible sense of synergy is a major factor in their newfound strength as they tend to collaborate across various groups to combine a wide variety of intelligence and attack methods, utilizing multiple strategies, or blended attacks. They do their research, assess your physical vulnerabilities, look at what you are working on, utilize technical exploits, and look at open source intelligence opportunities. They essentially engineer themselves into a position in which they can cause you the most harm. Furthermore, the concept of malware-as-a-service has become a trend, essentially putting highly sophisticated cyber tools in the hands of criminals with no cyber expertise. The ability to organize cybercrime has taken malware infections to a whole new level, and likely one of the reasons a new strand of malware is popping up consistently. It is vital to stay educated about the rapidly changing external environment to understand why your firm should be so diligent about protection against cybercrime. That being said, it is important to know what you do in your business that makes you a target, and to accept that some of these apply to the nature of your business; they usually cannot be changed. Being aware of these vulnerabilities will give you the necessary knowledge to look into ways to better protect your firm. 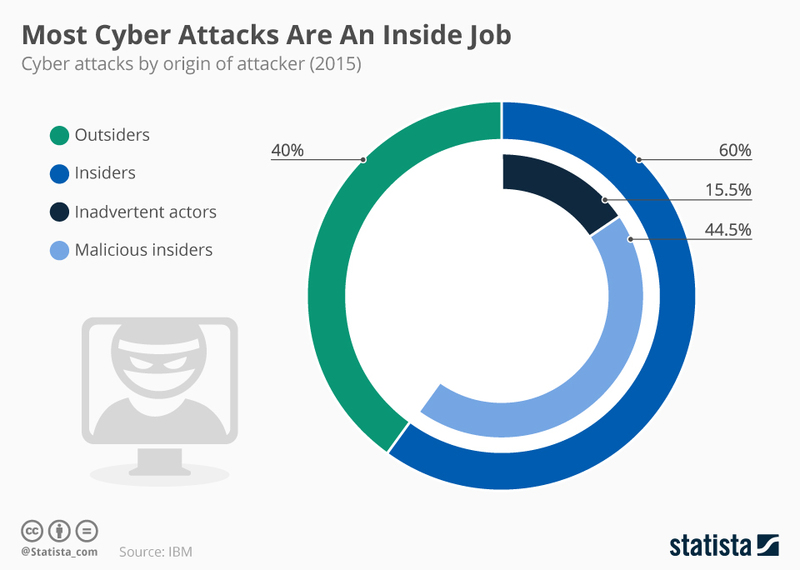 You have employees: studies show that 60% of cyber-attacks are an inside job with 44.5% of those attacks being from malicious insiders. – be aware of who you are hiring, train your employees well on all processes including security procedures, and implement security policies company-wide with no exceptions. You may still be wondering why a cybercriminal would waste their time attacking your small firm when they could attack larger entities. From the mind of a cybercriminal, your small firm is the ideal target. It is likely that a firm of your size does not have the same security budget that a larger company or firm would have; smaller companies and firms tend to have a less sophisticated cyber security in place and do not enforce the same level of data protection protocols as their larger firm counterparts. They will exploit vulnerabilities and weaknesses or gaps in your policies and procedures, such as the failure to check something more than once. Small targets also can mean big rewards; although you are a small firm, gaining illegal access to your data can assist a cybercriminal to later hack into a larger entity that you may have done business with. When you are doing business with a large company or firm, you may have passwords and other electronic access to their systems that will be far easier for a cybercriminal to attain through your entity. They will also masquerade as company officials to divert payments, aka “spoofing”; not just as officials inside of your company but officials of large companies and firms that you do business with. The cybercrime environment has become a frightening one, all things considered. It shouldn’t stop you from operating your business, but you need to be aware of threats to your business so that you can be proactive in fighting them. When WAMS is your IT partner, we assess your network and work diligently to ensure that you are protected and have the tools that you need to safely run your firm’s business. Please, always feel free to contact us with any questions at (800)421-7151 or email alopp@wamsinc.com. Working hard means you get to play hard – what’s better than a gaming session? The answer is a relaxing gaming session on dual monitors! With more screen space, you can see enemies from afar, anticipate their actions, plan your retaliation, and attack! Dual monitors benefit almost every industry because of the enhanced visibility, larger screen space, and how you can briefly nap behind them without getting caught! (though we don’t recommend it) Using dual monitors can enhance even your leisure time activities as well. Broaden your horizons by getting in touch with us at 800-421-7151. We’ll answer any questions you have. iOS 10 may still be in its beta stage, but Apple loyalists have grown accustomed to a level of hype in the months leading up to a new product release. Despite the announcements and presentations wrapping up last month, we’re just now getting wind of the unbiased opinions from developers who have courageously installed the upcoming version of iOS – and the news is good. Here are six of the most exciting new updates to Apple’s seminal mobile operating system. The iPhone’s native Messages app got a thorough overhaul, but we’ll leave the discovery of emojis, invisible ink, and ‘fireworks’ for another time. Those don’t have much place in the business world, but handwritten messages certainly do. Give your professional messages a more personal, attentive touch by writing responses with your fingers with the app’s Digital Touch option. Virtual desktops allow for better utilization of screen space. You can span your applications and windows across multiple “virtual” desktops. Create one by clicking on the “Task View” icon (located at the right of the Cortana bar) on the taskbar, then click “+ New Desktop” in the lower right corner and add as many desktops as you wish. To move an application to a new desktop, merely drag it into the virtual desktop on the bottom. Introducing the new built-in Snipping Tool. On top of capturing a full screen screenshot, other capturing options range from a free-form rectangle to a specific aspect ratio or even an entire window as well. You can also set the capture to delay a screenshot by a set interval – this comes in handy when you want to screenshot a YouTube video minus the playback controls. Drag a window to the right or left to split it in half. Drag a window to a corner to reduce it to a fourth of its size. Drag a window to the top to maximize its size. After launching the Xbox app, go to the app you wish to record and press Windows + G. You’ll be prompted with a window that asks: “Do you want to open the Game bar?” Click on the “Yes, this is a game” box and let the recording begin! Aside from typing your requests, you can also use natural language to ask Cortana to locate your vacation photos, or provide directions to your friend’s house. No date needed, just specific words and she’s all set. Cortana is also synced with your calendar, so if you’re ever unsure when your meetings are, Cortana will gladly double-check. When activating battery saver in Windows 10, you can limit your portable devices’ background activity and push notifications to prolong battery life. Battery saver also kicks in automatically once your battery life is lower than 20%. To customize your own power threshold as well as which applications you allow to run in the background, go to Settings > System > Battery saver – voilà! Make the most of Windows 10 with these tips and upgrade your user status from regular to power. Regardless of what you’re using it for – arranging your meetings or planning your vacation – make each computing experience a memorable one. Want to hear more of the latest Windows 10 news and updates? Contact us today. Update all of your software and your operating system as often as possible – it’s that simple. New versions come with better protection and fix any newly discovered loopholes. If you are too busy or can’t find the time to do it, check for an automatic update option. Any excuse for postponing updates will feel a lot less valid when it means a security breach or system crash. While in-depth security measures need to be implemented and managed by experts, little steps like the ones listed here can be just as important. Check back often for more helpful cybersecurity tips, but if you have more urgent security needs for yourself and your business, our experts are ready and waiting to offer a helping hand – why not reach out to us today? (800)421-7151. Here on earth, clouds are relatively simple phenomena: visible masses of water vapor making their way across the sky. But in the world of IT, “the cloud” is a bit more complex, referring to technology that allows businesses to take a more hands-off approach to managing their IT resources. Also, the “hybrid cloud” is rapidly becoming the most popular variety. A recent “State of the Cloud” report indicates that 71% of all cloud users are now implementing hybrid cloud solutions, mainly because the ways in which they benefit firms and small businesses are so numerous. Here we’ve highlighted what we consider to be the 4 most significant benefits of hybrid cloud solutions. Last, but certainly not least, are the security advantages of a hybrid cloud solution. Firms are able to host within the private cloud their more sensitive data such as an e-commerce website or HR platform, while using the public cloud space for less sensitive data where it’s more cost effective and there is less likely to be major problems should there ever be a security breach. So as more of our customers’ IT infrastructure moves to the cloud, we’re adapting and developing innovative ways to maintain hybrid cloud environments. What this means for you is we’ve got the know-how to provide outright cloud solutions, or at the very least the expert consultation you need, to ensure that your day-to-day operations transition to a hybrid cloud solution without interruption and in a cost-effective manner. Contact us today to learn more about the benefits that the hybrid cloud can bring to your business at 800-421-7151. Unfortunately, that statement is becoming more common among small businesses, according to Mitchell Thompson, head of an FBI financial cybercrimes task force in New York. The FBI reports that since October 2013 more than 12,000 businesses worldwide have been targeted by social engineering–type cyberscams, netting criminals well over $2 billion. And those are just the reported cases. Often, due to customer relationships, PR, or other concerns, incidents go unreported. Baiting – In baiting, the attacker dangles something enticing to move his victim to action. It could be a movie or music download. It could also be something like a USB flash drive with company logo, labeled “Executive Salary Summary 2016 Q1,” left where a victim can easily find it. Once these files are downloaded, or the USB drive is plugged in, the person’s or company’s computer is infected, providing a point of access for the criminal. Phishing – Phishing employs a fake e-mail, chat or website that appears legit. It may convey a message from a bank or other well-known entity asking to “verify” login information. Another ploy is a hacker conveying a well-disguised message claiming you are the “winner” of some prize, along with a request for banking information. Others even appear to be a plea from some charity following a natural disaster. And, unfortunately for the naive, these schemes can be insidiously effective. Pretexting – Pretexting is the human version of phishing, where someone impersonates a trusted individual or authority figure to gain access to login details. It could be a fake IT support person supposedly needing to do maintenance… or an investigator performing a company audit. Other trusted roles might include police officer, tax authority, or even custodial personnel, faking an identity to break into your network. Quid Pro Quo – A con artist may offer to swap some nifty little goody for information… It could be a t-shirt, or access to an online game or service in exchange for login credentials. It could even be a researcher asking for your password as part of an experiment with a $100 reward for completion. If it seems fishy, or just a little too good to be true, proceed with extreme caution, or just exit out. Tailgating – When somebody follows you into a restricted area, physical or online, you may be dealing with a tailgater. For instance, a legit-looking person may ask you to hold open the door behind you because they forgot their company RFID card. Or someone asks to borrow your laptop or computer to perform a simple task, when in reality they are installing malware. The problem with social engineering attacks is you can’t easily protect your network against them with a simple software or hardware fix. Your whole organization needs to be trained, alert, and vigilant against this kind of incursion. Don’t let your organization be caught like a sitting duck! You’ve worked way too hard to get where you are today to risk it all due to some little cyberhack you didn’t know about. Call us at 800-421-7151, or e-mail alopp@wamsinc.com before your company becomes yet another social engineering statistic. Keeping up with tech trends as a firm owner or small business owner is tough. Virtualization may be a great example of this, but it’s definitely worth the effort. Between the boost to network security and ability to scale your workstations and servers according to your business growth, it’s time to start learning a little more about it. One of the first steps towards virtualizing your business is picking a software provider, which is why we’ve put together 5 of the most prominent platforms into one list. Any conversation about virtualization for firms and small businesses usually starts around VMware. Although it wasn’t necessarily the first, VMware was the company that really put office virtualization on everyone’s action item list. The company offers a number of different solutions for different sized businesses with a wide variety of needs. Its ease of use and robust security features have secured its reputation as one of the best options for virtualization. An average user may not recognize the company name, but has a good shot at previous knowledge of their popular remote access tools, GoToMyPC and GoToMeeting. Citrix has specifically geared their virtualization software, XenApp, XenDesktop, and VDI-in-a-box toward small and medium-sized businesses and even claims that non-IT staff can easily manage and administer the services. They even provide a free trial to prove it. This company just keeps getting bigger and bigger. Specializing in marketing software, they also offer database management, cloud storage and customer relationship management software. If you’re using any of their services already, there could be benefits to enlisting their virtualization services as well. Oracle does everything, server, desktop, and app virtualization, and they believe that consolidation of all of these into one solution is what sets them apart. Since we’re on the topic of household names, let’s talk about Amazon’s EC2 platform, which hosts scalable virtual private servers. The ability to scale and configure capacity is definitely EC2’s biggest draw for SMBs, who are preparing for the possibility of rapid growth. Although almost any virtualization service is rooted in scalability, Amazon is leading the pack in how quickly and finely you can adjust your solution to your individual needs. Virtualization is a really hard topic for most firms to tackle. This list only covers the most popular vendors, and there are plenty more out there. Choosing one based on its application possibilities and management requirements is not a subject for the lighthearted. Get in touch with us today so we can break down all of the technobabble into easy-to-understand advice and expertise at 800-421-7151. If the name wasn’t clear enough, ‘bloatware’ is unnecessary manufacturer software that comes preloaded on new hardware. Just about no one likes it, and now Microsoft is giving us a tool to trim the fat. It may seem like small potatoes to anyone who hasn’t spent an afternoon removing apps one by one, but for the rest of us it’s a welcome blessing. Let’s take a minute to examine Windows’ new tool a little more closely. You may be able to adequately navigate your way around a Windows machine, but there are often shortcuts that insiders use to speed up otherwise mundane management tasks. For any Windows projects or problems you have, drop us a line at 800-421-7151, we’ll have them fixed faster than you can uninstall that CD-burner utility that you never asked for. Network security isn’t something to be taken lightly, if you are unsure about how safe or how capable your systems are in fending off cyber threats – get in touch with us at 800-421-7151. Our experienced and friendly staff will help you with any ransomware or security-related issue you have.